The other day's tutorial was on Behavioural Finance vs the Efficient Market Hypothesis (EMH). Perhaps not as challengingly deep and on-topic as I would have wanted, but nevertheless alright. My biggest concern was how the Behavioural Finance proposers did not respond to the Fama-French 3 Factor Model known to every finance student. 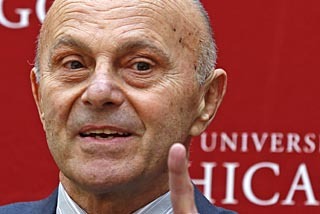 It was Eugene Fama's and his college Kenneth French's response to the mounting critique against the EMH (from say behavioural finance) in the 1980s. According to Forbes, their classic 1992 article is the most widely-cited article in financial economics. And thus kinda weird that we didn't even consider it in the tutorial. From memory I wanna recall that the "new" 3-factor model explains some 90% of excess returns on surveyed portfolios, i.e, a pretty good explanation (especially over CAPM). And a fierce contender for those who say EMH fails on empirical grounds. I was not aware of many good critiques against the 3-factor model, and my tutorial unfortunately did not deliver on this. Though I'm pretty sure it exists in the Behavioural Finance jungle, and I'll track it down one day. However, I did find that Fama-French (2015) recently produced an improved version, the Five Factor Model! I remember that was a lame critique against the 3-factor model: "Ok, are you simply gonna add a new factor every time you find something your model doesn't explain?". Well yes - Why not? That's progress. The "exception" they mention is their own revised model, that drops one of the initial factors (HML; that high P/B companies underperform low P/B companies), since it becomes statistically redundant when they have added their two new factors, Profitability and Investment. The latest contribution by Fama & French doesn't really change anything in terms of the dispute between EMH supporters and critiques from say his co-Nobel Laureate Shiller, or the Behavioural Finance camp, or from Austrians. It does however pose a slightly more daunting challenge and a more empirically rigorous defense of the EMH which anyone who criticises it must address. Their econometrics is generally beyond me, but one day I'm gonna master it. I don't have to accept the EMH in order to appreciate the work and the beauty of their research. On the contrary, I think anyone who aspires to be an economist must learn the ins and outs of such ground-breaking research as EMH, regardless of whether its conclusions are reasonable or not, applicable or not, in line with your ideological presuppositions or not. There's some good Austrian writings on it, see for instance Shostak (1997) and Pasour (1987) or a couple of Mises Daily articles (here or here) if you're interested.